Aquabio is part of Freudenberg Filtration Technologies. Both companies are pioneers and a driving force in the development of enhanced energy- and cost- efficient systems. This opens up significant competitive advantages for their customers. Freudenberg Filtration Technologies is a global technology leader in air and liquid filtration, offering a comprehensive range of filters, systems and services. 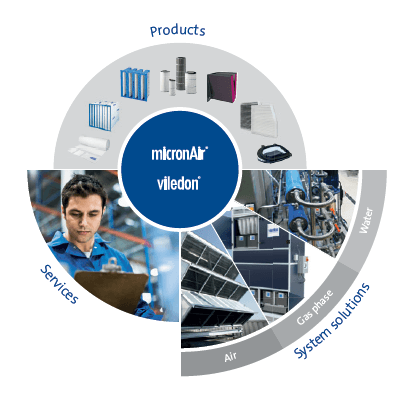 The global Viledon® and MicronAir® brands are synonymous with top-quality filtration for both industrial and consumer applications. With the energy-efficient solutions that the company provides, Freudenberg Filtration Technologies helps its customers to conserve resources, reduce CO2 emissions, drive down costs and gain competitive advantage. Aquabio is a well-known provider of water treatment and wastewater filtration systems for industrial applications. Since 1997, the company has been developing and manufacturing fully integrated membrane filtration systems that enable the economical recycling of wastewater. The Aquabio process-led approach to all aspects of water and wastewater treatment ensures that the most appropriate technology is identified for each unique application.